When planning for Section 10 Postal Specialties, the USPS isn’t the only governing body that will apply to your project; ADA, FHA and local codes must also be considered. In the Postal Operations Manual, the USPS not only specifies the form of delivery needed and the type of equipment to use, but the placement of that equipment within a community as well. The primary consideration for the postal service is to find the safest and most efficient line of travel to the mailboxes. Naturally the safety and accessibility for all users - carriers and residents alike, is also very important. Working with local postal officials during the same time you would for other “utilities” will ensure you don’t run into significant headaches later. No patron (tenant) lock shall be located more than 67 inches above the finished floor. No parcel locker compartment (interior bottom shelf) shall be positioned less than 15 inches from the finished floor. No customer compartment (interior bottom shelf) shall be positioned less than 28 inches from the finished floor. For interior mailrooms, the ADA specifies that at least 5% of the mailboxes must meet accessibility guidelines. Local regulations may override this percentage and require 100% compliance. Typically, it is the local jurisdiction codes office/inspector that will designate if an installation must meet only the min ADA requirement of 5% or if it should be 100% compliant; there is usually very little in between. Current practice is to use sequential numbering on the mailboxes, rather than matching identification to the apartment numbers. This allows greater flexibility in providing accessible mailbox compartments that meet the necessary accessibility regulations. Sequential numbering also provides greater privacy and security for residents by not tying the mailbox to a specific apartment or house number. Another option to ensure 5% of your mailbox installation is compliant is to install an additional set of mailboxes which fully meet compliance and would only be available for designated mobility units within the community. Mailboxes must comply with Section 309 specifications governing a location’s clear floor space, equipment height, and operation. ADA sets forth a forward reach range that is between 15 and 48 inches, which is lower than the 67” the USPS specifications allows. ADA also sets forth the same range for side reach ranges; which is again lower than the USPS specifications allow. The Fair Housing Act was enacted and amended prior to ADA to cover those with disabilities as it relates to housing. The design guidelines from FHA are the primary specification that should be followed when designing for multifamily communities. Essentially while FHA covers a broader class of individuals and housing issues than ADA, it applies to all aspects of the community associations. If you are designing in the multi-family space, regardless of housing use, and the building has an elevator, FHA will apply. It will also apply if the dwelling has more than four units, even if they are all ground level. FHA has very specific requirements when it comes to the overall dwellings, but there are only two requirements that would pertain to Section 10 Postal Specialties; requirements 1.) Accessible building entrance on an accessible route, and 2.) accessible and usable public and common use areas. These Guidelines establish ANSI as a minimum standard of compliance when designing Public and Common Use areas. Since ANSI does not provide a standard specifically for mailboxes, designers must consult the related human factors and performance specifications to design the accessible features. The reach ranges called out in ANSI are the same as ADA for the forward approach, but FHA has a taller side approach. The primary difference between FHA and ADA on this point is that ADA compliance requires only 5% of the mailboxes to fit within these ranges, while FHA requires compliance to match the appropriate number of covered dwellings pertaining to FHA within the community. However, there have been DOJ lawsuits in which the opinion of the presiding official was that 100% of the mailboxes had to be accessible regardless of the number of covered dwellings. The DOJ and Urban Planning have jointly stated that if a project falls under both FHA and ADA, it must be designed to comply with both sets of regulations. When applying this to mailboxes, it means the more stringent requirement of the two regulations must be used in planning. 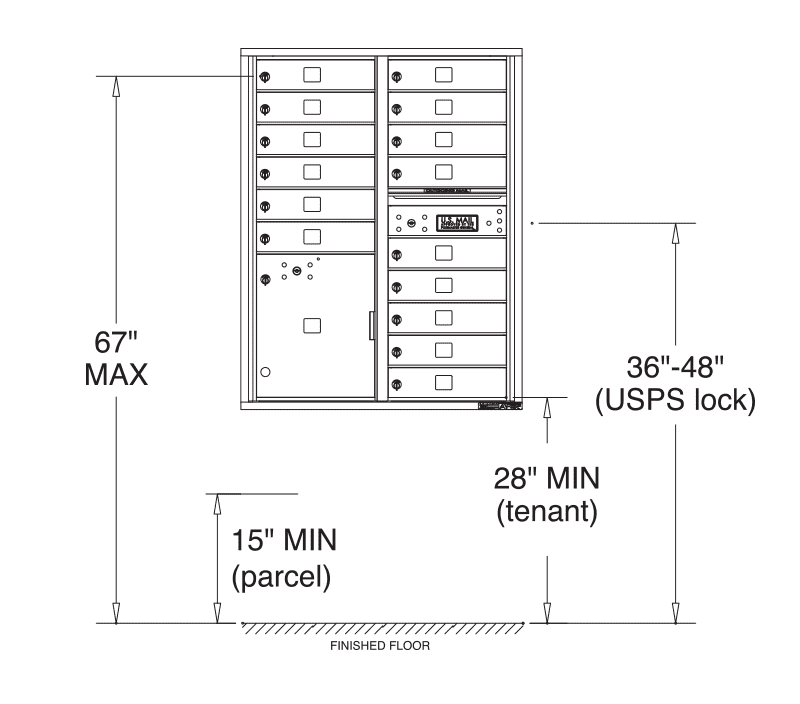 When we layer the USPS on top of FHA and ADA, the intersection, or most stringent requirement of compliance for all three of the reach ranges is for mailboxes to be installed no higher than 48” from the finished floor. Careful attention should be paid to the lower reach range, as the USPS dictates whether it can be 15 or 28 inches based on the compartment types on the bottom row of the module. Determining if your project must comply with all three agencies as early as possible in the designing phase will ensure you allot the appropriate amount of space needed for today’s larger mailroom requirements. The Postal Service has the authority to deny service to mailboxes which are improperly installed. This could cause significant delays in certificates of occupancy as well as actual mail delivery to the residents. There are hundreds of examples where the proper authorities were not contacted early on and mailboxes had to ripped out of marble walls or other such finished surfaces, or where the architect had to find a second and even third location to ensure sufficient space for the mailbox installation.